*Als "Thugdam" wird ein Zustand tiefer Meditation zum Zeitpunkt des Todes bezeichnet. In dem Moment des Sterbeprozesses, in dem der "äußere Atem" aufhört und die Energien sich im zentralen Energiekanal des Körpers zusammenziehen, zeigt sich für einen Moment die Natur des Geistes. Gewöhnliche Wesen können diesen Prozeß normalerweise nicht bewußt miterleben, da die Eindrücke, die dabei im Geist entstehen, so stark sind, daß eine Ohnmacht eintritt, aus der man erst drei Tage später im Bardo, dem Zustand zwischen Tod und Wiedergeburt, wieder erwacht. from a Dzogchen point of view." mit einem kleinen Mitbring-Mittagsschmaus feiern. Am Samstag abends werden wir im Garten ein Osterfeuer entzünden, wer mit uns und Lama Lena den Abend verbringen möchte, darf auch gerne auch ein bisschen Speis und Trank mitbringen. Es gibt nach zwischendurch die Möglichkeit für persönliche Gespräche mit Lama Lena, wenn etwas Wesentliches zu fragen ist. James wird mit uns einen tieferen Blick in die Natur von Anhaftung und Festhaltenwollen werfen: Wie wir uns mit vorübergehender Erfahrung identifizieren, als wäre diese etwas Reales, auf das man sich verlassen kann. Und wir betreten Wege des Loslassens und Freigebens von Erscheinungen und ruhen in natürlichem Gewahrsein. "Die Welt als schöpferischer Ausdruck der Leerheit"
The infinite diversity of experiences and their actual nature are non-dual. Yet the actuality of each particular occurence is beyond judgement. Yet the forms of appearance are unobstructed, being complete as they are. Spontaneously abiding and so everything is settled. IST JENSEITS VON URTEILENDEN KONZEPTEN. ALLE ERSCHEINUNGSFORMEN SIND UNBEHINDERT, VOLLENDET SO WIE SIE SIND. WIR WEILEN GANZ SPONTAN - ALLES VOLLENDET- NICHTS WEITER ZU TUN. jeweils 9h - 10 Uhr: Meditationspraxis mit James. Nuden Dorje: "Wenn Du die Falschheit deiner Verwirrung erkennst, verweile ohne künstliche Hinzufügungen und ohne Anstrengung in der natürlichen Seinsweise (Dharmakaya):"
James: "Was für uns zu erkennen sehr wichtig ist, ist die eigene Falschheit. Das ist nun kein Urteil, dass wir manchmal authentisch und manchmal falsch sind. Es bedeutet, das alles an uns, was mit unserem gewöhnlichen Gefühl eines Selbst zu tun hat, falsch ist, weil es auf einer falschen Auffassung von der Natur der Wirklichkeit beruht.....Es geht uns wie Leuten, die auf der Universität ihr Abschlussexamen ablegen sollen. Sie gehen dann in den falschen Prüfungssaal und lesen die Fragen nicht sehr genau. Sie schreiben dann sehr lange Antworten zu ihrem Thema, das aber unglücklicherweise nicht jenes ist, zu welchem sie geprüft werden. Es ist völlig egal, wie gut ihre Antworten sind, sie werden durchfallen, weil sie sich nicht auf die eigentlich gestellten Frage eingehen. Die grundlegende Frage ist: "Wer bist Du? ", "Wer bin ich?" aber wir verstehen die Frage nicht und antworten mit endlosen Geschichten von Selbst-Definition. Dies überdeckt die Frische der Frage, die Möglichkeit des Schauens und Nachforschens, und so sind alle unsere Antworten abgestanden, die Wiederaufbereitung von Selbst-Schutz-Versionen, die aus unüberprüften Elementen fabriziert werden. Wir haben viele viele viele Antworten, und alle sind sie falsch. Daher ist es so wichtig, wenn wir meditieren, dass Du Deine volle Enegie einsgerichtet in die Praxis einbringst, um diesen grundlegenden Initial-Fehler, welcher Subjekt und Objekt entzweit hat, zu reparieren. Es ist sehr wichtig, aufzuhören damit, sich dafür zu schämen, falsch zu sein. Wir müssen sehen lernen, wie Falschheit aufkommt, wie sich diese Trübung und Verdunkelung entwickelt. Wir wollen unsere "Falschheit" ganz direkt anschauen und ihre Tricks verstehen lernen, damit wir ihnen nicht auf den Leim gehen. Dies hilft, den Raum zu öffnen, in welchem wir unsere eigene wahre Natur erkennen können. Wenn Du die Falschheit deiner Verwirrung verstehst, verbleibe ohne Künstlichkeit und völlig anstrengungslos im natürlichen Zustand (Dharmakaya). "Dharma Quote of the Week"
What is very important for us to recognise is our own falsity. This is not a judgement that sometimes we are authentic and sometimes we are false. It means that everything about us in our ordinary sense of self is false because it is grounded on a misapprehension of the nature of reality.... It is like somebody in University who is having their final examinations. They go into the wrong examination room and not reading the questions very clearly they write very long answers on their own subject that is unfortunately not the one they are being examined on. It does not matter how good the answer is they will fail, for they are not addressing the question. The basic question is always: "Who are you? ", "Who am I?" but we do not understand it and so we answer with a ceaseless narrative of self definition. This covers over the freshness of the question, the possibility of looking and seeing, and so all our answers are stale, the reworking of self-protective versions constructed out of unexamined elements. We have many, many, many answers and all of them are false. That's why it is very important when you do meditations, to put your full energy one-pointedly into the practice, to try to repair the initial basic fault that has torn subject and object apart. It is very important to stop being ashamed of being false. For we have to see how falsity arises, how obscuration develops. We want to look directly at our falsity and learn its tricks so that we will not be caught by them. This helps to open the space in which we can recognise our own nature. Wir müssen uns im Zustand des ursprünglich reinen Rigpa üben. Auch wenn die Essenz primordial erleuchtet ist, muss der Yogi wieder-erleuchtet werden. Wir sind in die Täuschung gefallen. Stabilität in Nicht-Täuschung zu erlangen wird "Wieder-Erleuchtung genannt." We should train in the state of rigpa that is originally pure. Although the essence is primordially enlightened, the yogi has to be re-enlightened. We have fallen into delusion. Attaining stability in non-delusion is called re-enlightenment. 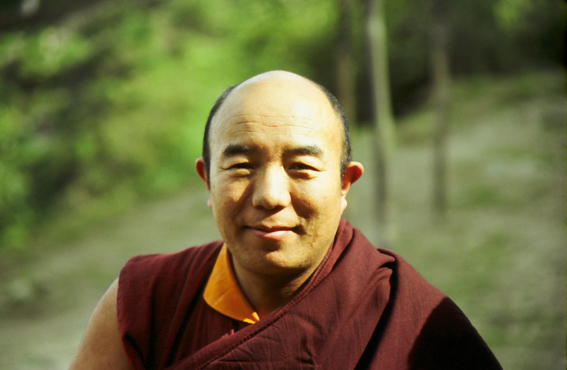 Tulku Urgyen Rinpoche: "As It Is"
"Here we are, we are all alive, and maybe one of the most important things is to think a little bit about our experience of being alive. Of course in the middle of our life events are happening all the time, thoughts are coming, feelings, sensations, we all have many plans, and of course we have memories as well, a whole construction out of which we try to make sense of what's going on. Sometimes our hopes are fulfilled sometimes they are not fulfilled. Well let's try to see a little bit more how to have some space and a freer sense of movement within this process. Because our life is already in process, things are going on, moment to moment some stimuli coming from outside or from inside and in the midst of this process there is a kind of pressure that can build up inside us. A sense of "I should be achieving more, I should be getting more, I see what other people get, I see all the things that I've tried and haven't worked out." So our life is both an immediacy of what's going on, but also a story-line that runs inside ourselves. These stories are sometimes rather harsh, rather persecutory, and we can only do our best. Is that really all? Let`s maybe look at the basis. Here we are - alive. What does it mean to be alive? Essentially something is happening. We have our body, which has eyes, ears, nose, mouth, and a wonderful texture of our skin. Moment by moment sensation and experience, the raw data of life, is occuring for us. It's occuring because we are alive. If we have ever been with a corpse, with a dead person, we see that their senses have closed, nothing more is happening for them. So what is the difference between life and death? When we are alive, something is happening, it happens to someone. It happens to me, it happens to you. What is this aliveness? It's a presence - I know: I am alive. How do I know I am alive? because things happen to me. That seems obvious, but who is the one that the things happen to? Who is this one that I call myself? I can tell you about myself, I can tell you where I am from, the kind of things I like to eat, the kind of work I do, but this is essentially to share a story. We all have many many stories that we can tell about ourselves. If we try to look underneath the story or through the story, moment by moment there is a felt sense - almost intangible, ungraspable - of being alive. I exist, but what do I exist as? Sometimes I am happy, sometimes I'm sad, sometimes I'm thirsty, sometimes I'm hungry. Each of these experiences in the moment of experiencing it seems completely real, completely true, it's the whole of my universe, and then it`s gone. What seemed to be me was arising for me due to causes and circumstances. If it's a hot day like today I start to get thirsty. Why I am thirsty? - which is an experience I am having - oh, because of the sunshine. When it`s hot, I get thirsty more quickly than when it's cold. That is to say, my personal experience, which appears to be something in me, defining how I am - I am thirsty - is dependent on events outside and inside. When it's hot, the body starts to sweat, it's draining the moisture from the body, and so thirst arises. What seems to be me as something internal definitive of who I am is actually an interplay of many relational forces. Events arise and they pass. Experiences arise and they pass. And yet there is a continuity of being. I am still me through all of these different experiences, so what is this "Me-ness" of me? If the content of my mind, the content of my experience, the feelings in my body, the hopes and fears that arise, the thoughts, the analysis of "Am I doing okay? Am I doing not okay? ", if we see all of these as a movement, as a sequence, a chain of events in time, still there seems to be a continuity of I, me, myself, which continues. What is this made of? It's difficult to see. Why should it be difficult to see who I am, if I am me? I can hold up my hand, I can look at my hand, that's not so difficult to understand, it's not so difficult to make sense of. Something is there: I can see my feet, I can see my clothes, I can see the houses, I can see people. Do I see myself in the same way? I construct an idea: I am like this, I am like that. But if we just pause for a moment and observe the function as it arises and passes, the feeling tone of being happy, the feeling tone of being sad, these temporary events are always passing, and yet I am here. The function of meditation is simply to give us more time to experience the movement of experience, the movement of events, and the stillness of the one who is present. Our own root nature or basic presence, basic capacity of existence is not something we can grasp or define or determine. It does not mean that it does not exist at all: That simply means it does not exist as a thing. Everything we say about ourselves is true and untrue. If I say I am thirsty, well, I am not always thirsty. If I say, I am from Scotland, that may be true, but I do not live in Scotland. So every kind of reference, every kind of construction relates to a set of events which is already changing, it's not fixed. Our age of course is changing, our health is changing, how we look is changing. What then is in ourselves that we can grasp onto? From the point of view of Buddhism, there is nothing to grasp. But moreover there is no need to grasp. Because when you grasp something, you always grasp what is left. A bit like trying to grasp a snake and finding that it has left its skin behind.The snake has gone off and we are left with the leftover; with something which simply remains, in that way what happened when I woke up this morning is gone. Having breakfast is gone. Now there is this moment, and even as it is arising, it is also passing. Nothing to grasp .... and that's okay. If there is nothing to grasp a lot of the work that I habitually do in trying to construct my life to build up a safe sense of identity is perhaps unnecessary. Why am I so busy trying to stabilize a sense of self, a sense of purpose to give myself a sense that I am a reasonable human being, that what I do is acceptable to other people, when every building block that it is made of is actually like a wave in the sea. The wave is there, undeniable, you see it, and then it's gone. The wave arises from the ocean and goes back into the ocean, the moments of our experience arise out of this open field and then vanish back into it. Then another wave, comes; the waves never stop. But what is the depth or the spaciousness of the ocean itself? Our mind, when we relax and look at it, is not a thing, that is to say, each of us is not a thing, we are an openess, a presence, an awareness, which is not resting on anything material, it's not generated by the brain. Our knowledge of the brain is a set of experiences which arise and move through the limpid clarity of the mind itself. We don't have a mind, it's not a possession, but the mind is rather the basis or the sphere within which all our experiences occur. Our mind is not something inside us, it's not a private possession, it's not a thing which can be determined, and so it's invulnerable. Of course our bodies are quite vulnerable, our personalities are vulnerable, that is to say the patterns of identification that we create about ourselves, how we imagine ourselves to be, this is very vulnerable to events. Friends don't seem to like us so much, then we feel hurt, or we have difficulties at work, we thought we would have a clear sense of how our lives would unfold, and it's gone, or suddenly we become sick, and we think: How can this be me, I am not this kind of person. This shouldn't be happening to me. I can't be me if this is happening, how is this possible? That shows us the way in which when we construct ourselves out of events, we are actually making a house of cards or making a house of sands, there is no solid essence to our sense of self; it's an illusory show which is true for the moment of it's occurrence, and then it is gone. So the main function of practice which is essentially profound relaxation and trust, as you give up the active work of constructing - to experience that everything is there already. Things are as the are. Instead of making excess effort which in fact merely obscurs the possibility of the opening of the door to see what is always there. If we stop doing that there is then a freshness; something is numinous, it is just there on the edge of our consciousness - but I want to understand, I want to find out what is going on ...... impossible!!! You can't find it, because you never lost it. Again it's not a thing; the biggest transformation we can make in our life is to stop objectification. Stop treating ourselves as fixed objects and stop treating other people as fixed objects. All moments of life are movements in an ungraspable field. Although we know people - we call them our friends, perhaps we even call some people our enemies, and that seems to give a concrete defined sense of who they are. Actually we only have moments of shared experience. What I call myself is never alone, it's always in a context. The experience of being something in particular arises because we experience a world of many particular things. In relation to who we are, in relation to our sense of purpose and meaning in life, the more we trust, that the dynamic flow of existence is something to participate in, to find our way in, and that we will find our way - this way will not be determined by our hopes and fears. Whatever plans we make always have to be changed. We often feel they have gone wrong. This is because the fantasy of control, the fantasy of power creates an internal world of thoughts, of hopes in which we make a beautiful map which we then try to force onto circumstances. But life, like the waves in the ocean, cannot be put into a frame. You can see the children on the beach. They have a little plastic bucket and they put the sand in the bucket and then try to put it upside down, and they start to make structures. Sand is like earth, it can take a shape. But if you put water in the bucket and you turn it upside down, it just moves away - it's the same with our life - it's always moving away and moving away, and simultaneously arriving: Here it is, here it is. So instead of trying to look at it from the inside out, if we relax we find that what we call the object or the outside or other people and what we call ourselves are not two separate things, the field of experience is non-dual, it has no separation at all. And this is revealed - as it is - just by relaxing and being present. Our own creativity is the thing that generates worries, confusions, problems, sleepless nights.... Allowing the energy of the mind to relax we give it a rest from asking it to provide the meaning of life as if we could think our way through to some defined conclusion, that we could arrive at the save place where we knew what everything meant. We probably are doing this for many years, and where has it got us? Life slips through our fingers, therefore keeping our hands open is a good idea. Trying to grasp that which slips away is ridiculous. So the basic function of practice is to help us to be alive, by recognizing what life is. It is the immediacy of participation in the arising of experience without planning, without controlling, trusting the dynamism, the free movement of the open ground of the mind and the open field of all that is around us, allowing this dynamism to move and pass, lifting us up and lifting us down, always with the unchanging stability of mere presence, just here we are - we can't say what it is, but it's always there. It's not so complicated, but we make it complicated by looking for something else. So the basic instruction is always: Please take a rest."